To go or not to go for ear stapling to lose weight? 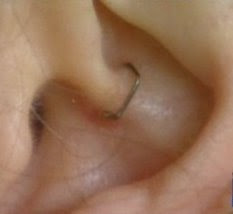 It seems there is a new trend among celebrities and their following fans when it comes to losing weight – ear stapling. Yes you heard right. Even though you can’t get the connection between the two things, I can assure you that this procedure is frequently used by people that have weight problems and their feedback is in favor of it. The idea is that by stapling your ear in a certain point in the cartilage your appetite is diminished and so you won’t be so tempted to eat so much. The next is of course losing weight because your body is consuming the remaining fat in the organism and so you’ll become slimmer and healthier. These facts are the point of agreement for most of the practitioners that encourage you to do this procedure by the cost of $35 to $60 per ear. They however disagree about how the system goes. I mean that some consider that the discomfort will distract you from eating and so become slimmer. Others claim that when we are in the womb our ears are very close to the tummy and this connection lives through our entire life. So when the ear receives a stimulus the stomach receives it too, changing your appetite and eating habits. Some practitioners think that by stapling the ear, a set of hormones is released into the body resulting in a general disorder in the system. Your body has to reorganize the hormonal flow, so neglecting the appetite function. It is important to remember that you have to re-staple your ear after say two months because after a while the body gets used to the metal and will stop the process I was talking about earlier. The more spiritual practitioners say that ear stapling is all about the qi – spiritual balance in everything. When you create an unbalance in your body, the general rule of qi will act to restoring the balance and for a while neglecting your appetite that is the least important at that moment. Another reason ear stapling is encouraged is because its closeness to acupuncture, a oriental procedure I’m sure you’ve heard of. If some time ago, oriental procedures were not taken in so lightly by the occident, now acupuncture is considered one of the best ways to get healthier and of course thinner.